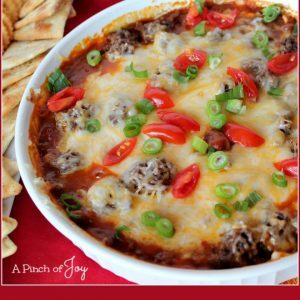 So quick and simple to make, Chili Cheese Dip goes together during the commercial and is ready to eat before the next break. Use the microwave, it will be ready in about 10 minutes including preparation, depending on your microwave. When ooey, gooey and hot through—it’s done. Or pop it in the oven and concentrate on the game, until the timer chimes. The ingredients are likely ones on hand and the directions are so simple anyone can do it themselves! If you can follow a Chilton’s manual, you tube directions on building a fence or figure out the newest phone – you can follow a recipe. No excuses, especially when the recipe is this easy. I used a handful of quartered grape tomatoes on top in the photo — the last ones from the garden — instead of chopping a whole tomato. You know ‘fraid of spicy me — I’m never going to use the option of adding jalapeno pepper. But there it is if you want to burn off your taste buds :-0) You could also add olive slices across the top of the heated dip with the sliced onions and tomato, if you like. Serve with crackers, tortilla chips or corn chips. Spread cream cheese evenly across bottom of pie plate. Layer evenly over cream cheese, first the chili and then cheddar cheese. While dip is baking, slice green onions and chop tomatoes. 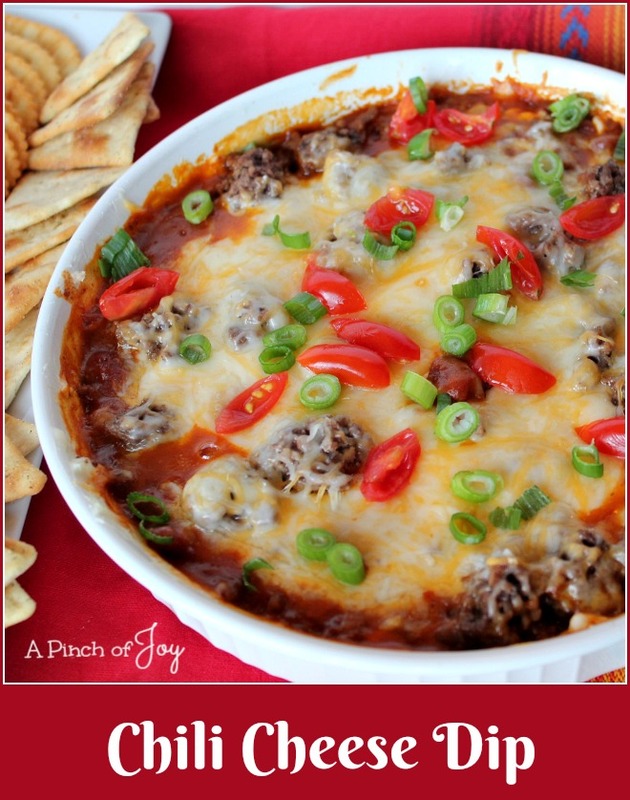 Bake 15 to 18 minutes or until dip is heated through and cheese is melted. Serve with tortilla chips or corn chips. Oh my! Devilishly delicious! This is definitely one to be shared at a Super Bowl party. Preferably one that I am too busy to eat too much! Thanks for the idea. My children will love it.